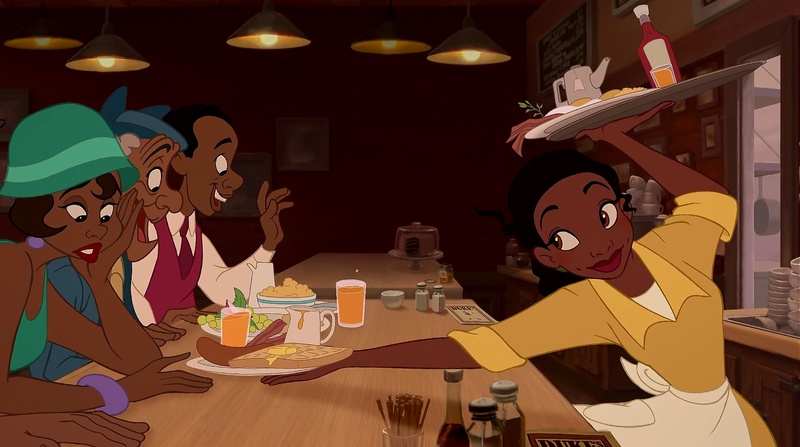 Above: Princess Tiana proved to be a different kind of princess when working toward her dreams. Stock Photo. Once upon a time, there was a princess who had something tragic happen to her, but soon she came across a prince and they fell madly in love until a villain messes up the whole thing, but do not worry because in the end the princess marries the prince and everyone will live happily ever after. If that sounds familiar, it is because that is the basic plot line of every Disney movie watched by children. Disney Movies are shown to children because of their simplicity and moral lessons. Although, there are several messages that are not as prevalent that are not good for children to watch. Of the 13 Disney Princesses from 1937 to 2013, only three of them, Pocahontas, Merida from “Brave” and Elsa from “Frozen,” ended their films without a prince. Though, Pocahontas did end up marrying in her second film. This means that no matter what these women conquered throughout their film, like Mulan saving China from the Huns or Tiana saving up money to open her own restaurant, they needed a man in the end to make them happy. In the latest Disney film, “Frozen,” the thought of what is true love is broken. In most Disney films, the act of true love is a kiss between the male and female leads right before the end. Toward the end of “Frozen,” it looked like this was going down the same route, but the act of true love came from an act of family with Anna saving Elsa. “We wanted to see if true love can mean something other than a kiss from Prince Charming,” said Chris Buck, “Frozen” co-director to Empire Magazine. Interestingly, all of the Disney princess films had men directing them. The two exceptions, “Frozen” and “Brave,” had male and female co-directors. One might also notice the lack of clothing characters are wearing in these films. Davis cites Jasmine from “Aladdin,” Tinkerbell from “Peter Pan,” and Kida from “Atlantis: The Lost Empire” as examples. But, it should be noted that men are also objectified in revealing clothing. Aladdin wears an open vest for most of his film, Li Shang does not wear a shirt for most of the training scenes in “Mulan” and Tarzan only wears a loincloth for the majority of his film. Until recent years, Disney films have portrayed princesses as very put together and not making many mistakes. Bell brought her quirkiness to Anna’s character, who trips and falls onto Prince Hans during their first meeting. Young girls who see the film are able to see that girls can be awkward and make mistakes because Anna was more of a real representation of what girls are like. Disney has started to break their stereotypes in films and is moving in a positive direction. There is still more to be done, but the company is staying true to mirroring society.